Though Sylvester Stallone has certainly starred in his share of movies over the years, there are two roles that immediately spring to mind whenever his name is mentioned, those being Rocky Balboa and John Rambo. Having originally played them at a younger age, Sly eventually reprised both decades later, further cementing their place in the annals of cinematic history. Believe it or not, the veteran actor/filmmaker looks to be far from finished, as Rambo 5 was announced not long ago. In it, the titular hero will take on a Mexican drug cartel in an effort to find his friend’s kidnapped daughter. If I were to hazard a guess, this picture will prove to be even more intense than an entry in the Taken franchise. 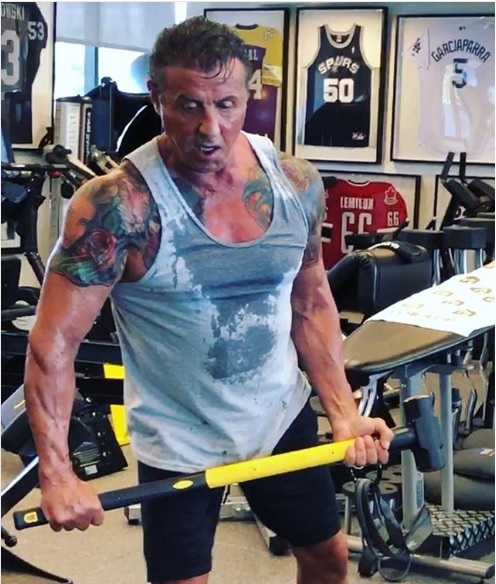 So, with filming set to commence this September, it comes as no surprise that Stallone make sure he’s in proper shape. I mean, it’s not like you’d expect him to slack, but it stands to reason that he steps up his game in the gym whenever cameras are nearly ready to roll. Really, check out the following image that he recently shared on his Instagram page and let us know if you’ve seen many other 72-year-old guys who are that jacked – or any age, for that matter. Historically, Stallone has been pretty proud of his workouts, so we fully expect for his latest routines to pay off once Rambo 5 reveals his physique. As always, keep watching this space for more updates.